I like that which is the extremely refined sound of a note made by an instrument. I find the sound of a note to be a very extraordinary, elusive and indefinable experience. I like the sound of one note next to another, or at the same time as another. The decisions to be made, from all the myriad array of sounds of notes, from all the potential possibilites of how to present and experience these sounds, is what draws me into the process which results in the making of a piece. I wrote cello piece in early 2004. Now, looking back into the piece from the outside, I see that I like clear lines, long bands of colour, the full length of a single crotchet, lists of sounds, gentle juxtapositions and distributions and heiroglyphs of sounds. To make a decision, or not to make a decision, and how to make the decision; then having done something, to do something else, or not; to repeat, or discard; to stay, or move on. 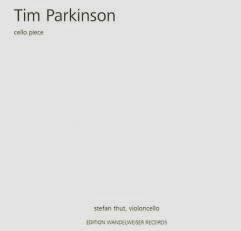 cello piece is made up of a complete performance of twelve pages of music which may be played in any order. On this CD, each page is a single track. For an authentic experience of this piece on CD it is advisable then to play the tracks in a random order each time. Each track is a potential beginning, middle or end. There is no single preferred path through the piece. cello piece was made for Stefan Thut in "4 Konzerte zu Marcia Hafif" at the Galerie Mark Müller in Zürich in 2004, organised by Manfred Werder in collaboration with Mark Müller.